You are here: Home / Administration / Outlandish marketing for your benefit auction? Not really. Outlandish marketing for your benefit auction? Not really. Marketing works! Could you use this concept for your benefit auction? Earlier in September I was in New York for business. 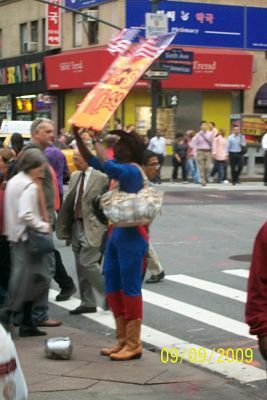 New York City has a lot of street hawkers, and this guy was selling purses. 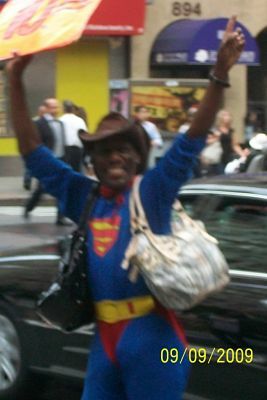 He was dressed as Superman. Carried a purse over each arm. Held up a big sign indicating the price. Wore a big smile and “danced a little jig” to music blaring from his portable CD player. While he oversaw the “in your face” marketing, his two buddies sold purses. Is this idea crazy for your benefit auction? This past spring, one of my clients promoted their school auction in this way. The President of the Board dressed up like a mime to match the Moulin Rouge theme of the auction. He greeted every car as it pulled into the school parking lot that morning. As a mime, he couldn’t say anything, but he handed them a flyer advertising the school’s auction fundraiser, while the Auction Chair stood nearby to answer questions. Purses for sale – corny or fun? I’d say both. It’s a unique way to catch your guests attention when they least expect it. It shows them that your auction is about having fun, and the party is starting … right now.